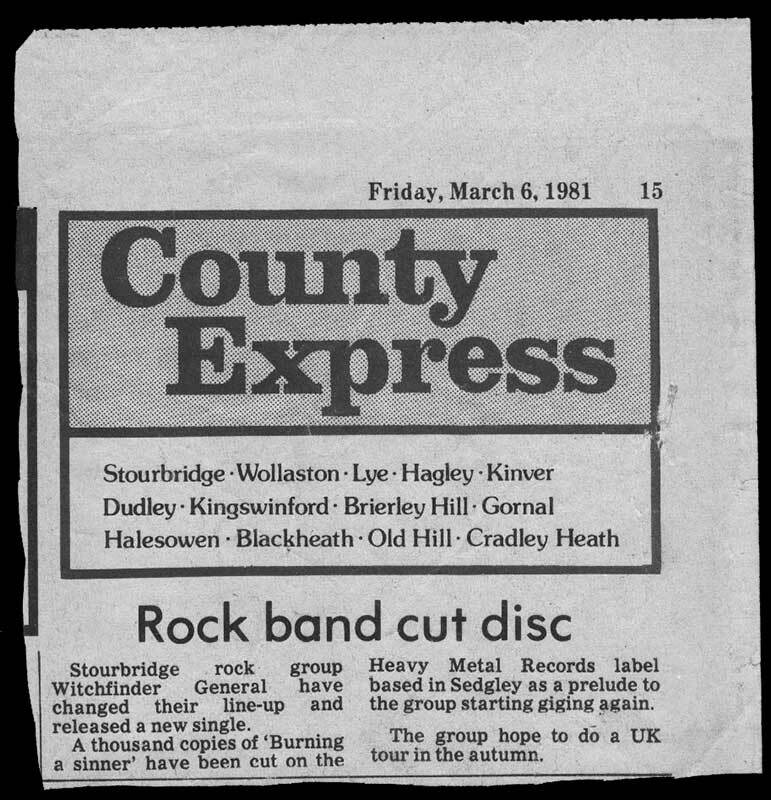 Here are some old press clippings. And if ya keeps scrolling, you’ll get to read some cool tidbits of truth below. This will give you an idea how hard it is to find Witchfinder stuff. I FINALLY found an ad from Sounds.. one I have seen only once before in a friends collection. 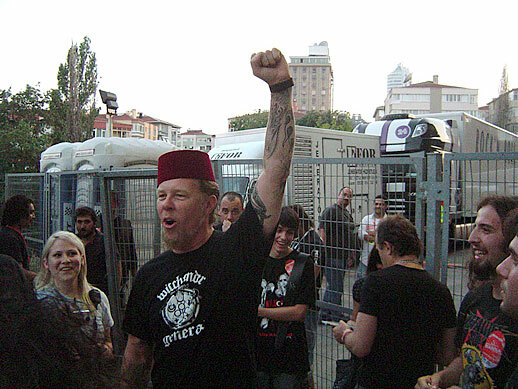 Watch the video and check out the t-shirt James Hetfield is wearing. OK so it’s a bootleg t-shirt. 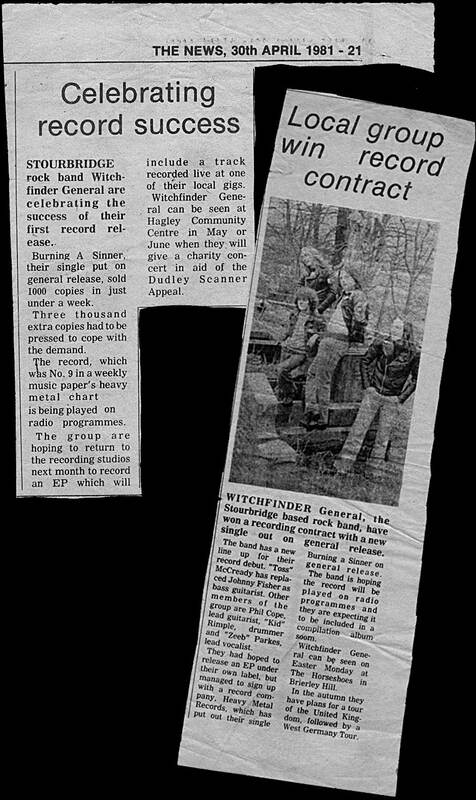 That in itself is ironic and funny, but hey it’s proof again that Witchfinder General are held in the highest esteem by rocks royalty. This just in, from Phil Cope himself. And there’s photos! 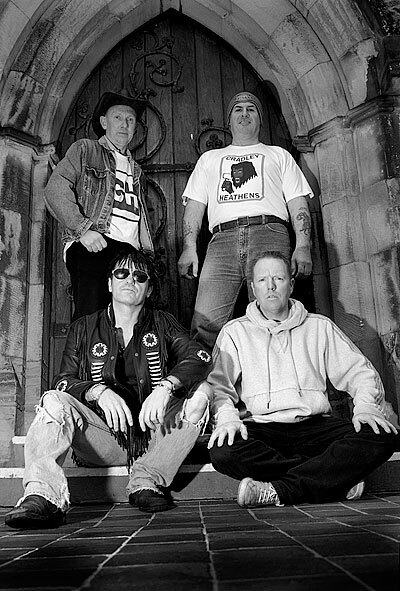 The first official band press photos in 24 years! Phil Cope, Dermot Redmond, Gary Martin and Rod Hawkes. There ya have it kids. Straight from the horses mouth. 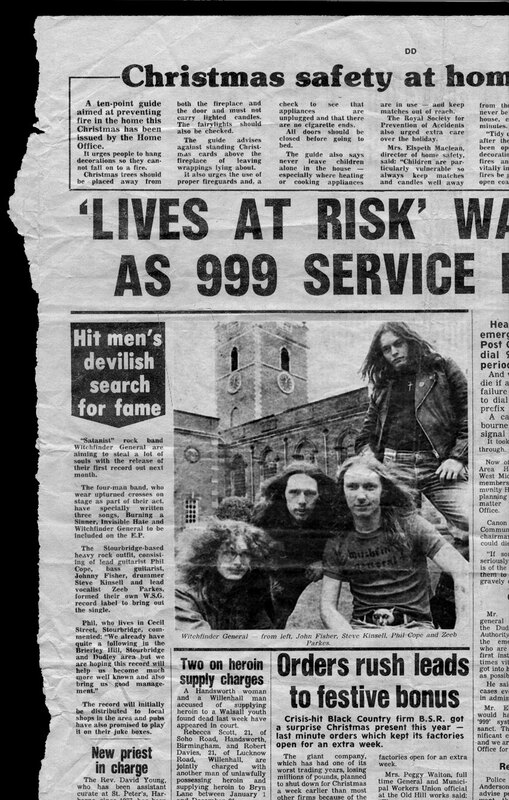 The Grave Snatchers and Church Gate Crashers over at Nuclear War Now/Buried by Time and Dust have made the treacherous journey to Stourbridge England to raid the burial site and exhume the most obscure and arcane material from the grave of Matthew Hopkins the Witchfinder General! 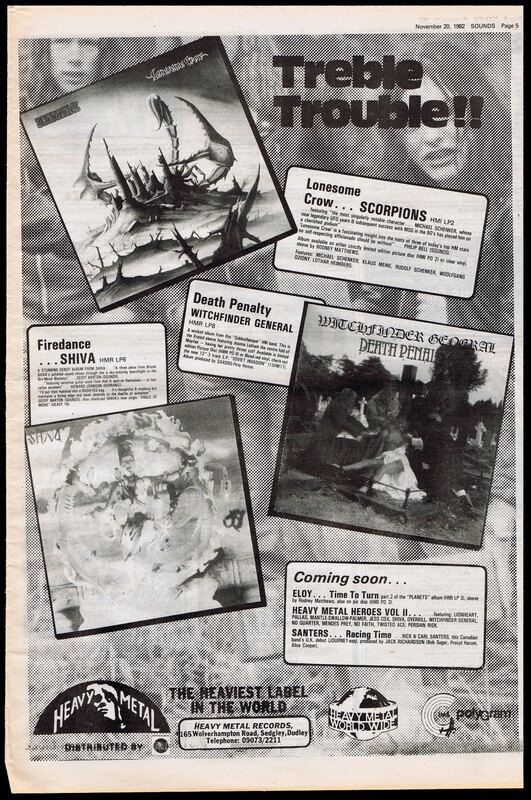 Their path guided only by a hooded robed figure in the form Mr Phil Cope the release couples for the first time the Burning a Sinner 7′,Soviet Invasion 12′ and 4 live tracks from 1981 including the never heard before Phantasmagorical! The package features never seen before photos of their first original recording line up of Zeeb Parkes/Vocal,Phil Cope/Guitar,Toss Mccready/Bass and Steve Kinsell/Drums along with photos of the original written lyric book for many of the songs,gig flyers and original artwork and perhaps some other suprises. The package will include the usual Nuclear War Now attention to detail and deluxe packaging. All flowery language aside, come experience the scariest most wicked old school doom this world has experienced for a long while! Oh yeah..and for what it’s worth I heard the whole thing today and while this is all new……yeah…I think this is my favorite album ever. Here’s a sneak peek at the boys recording. 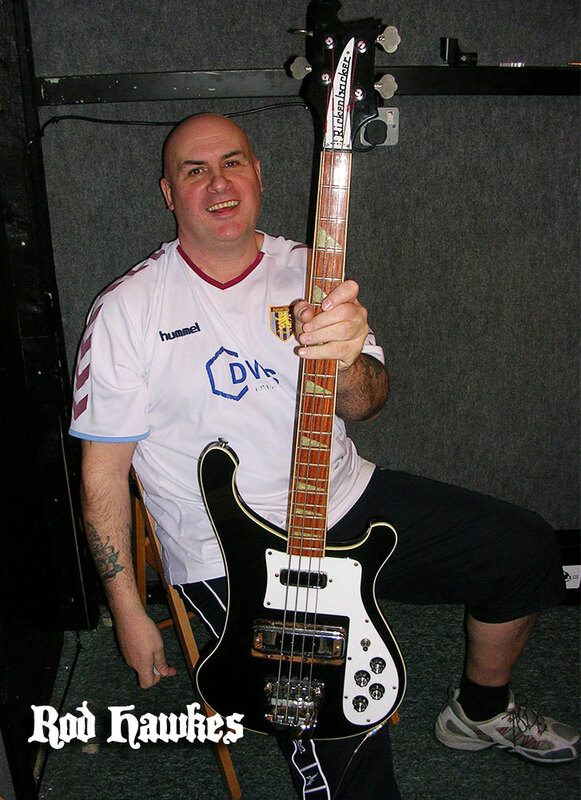 Behold the mighty Rickenbacker 4001 Bass Guitar. This is the same bass that Geddy Lee and Cliff Burton were most famous for. And believe me, Rod can make it thunder. Derm layin’ it down, old school. Now those are some shiny new cymbals! Expect to hear some awesome rich tones and pummeling fist shaking beats soon. With over over 25 years of experience as a front man, Gary brings an experienced voice and all the attitude befitting the Witchfinder General . He may not squeak like Zeeb, but expect him to GROWL! 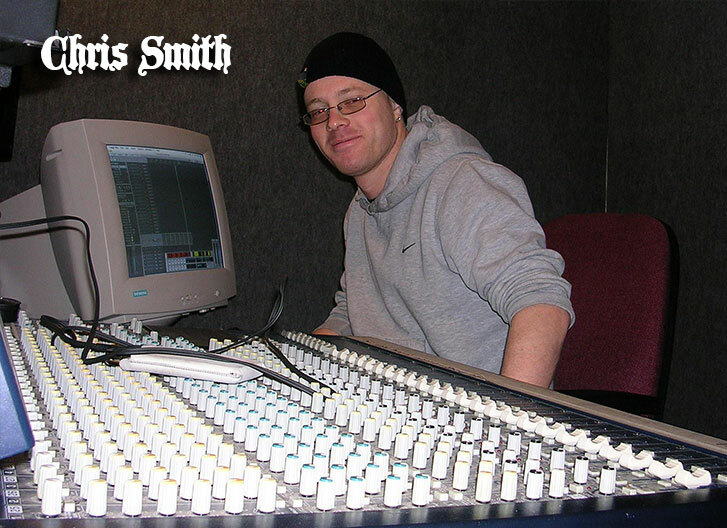 This is the man responsible (along with input from the band) for engineering what will be Witchfinder General’s third studio album. Oh I hate waiting, but I know it’s going to be well worth it. 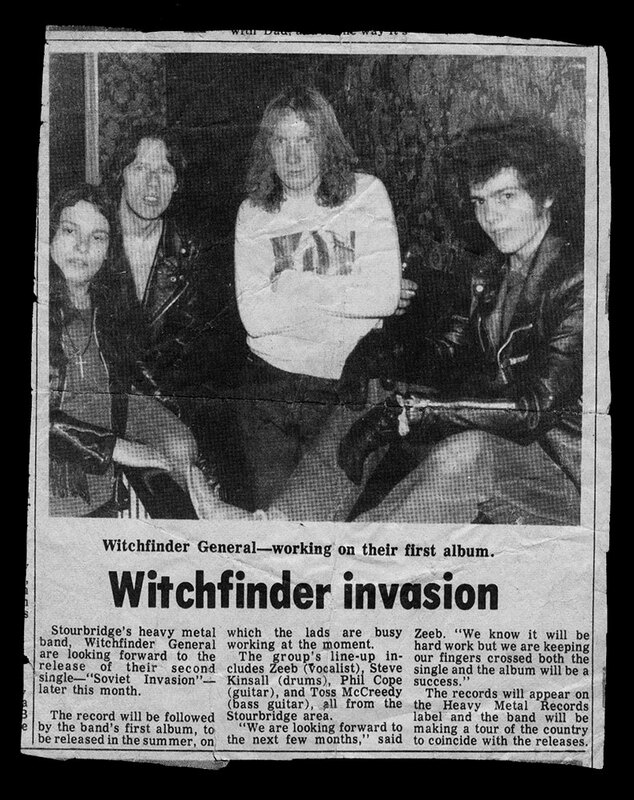 Gary Martin will be the vocalist on the new Witchfinder General album. 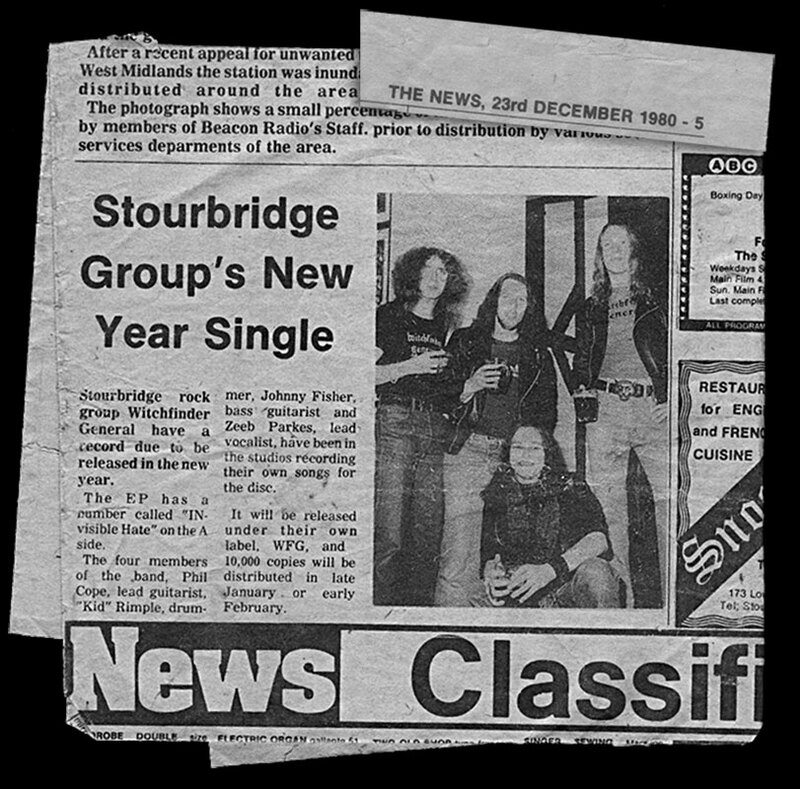 He sings for a Stourbridge group called Permission to Rock. I met Gary last week and he is very keen on the project. He has a very powerful and varied voice and I know he will do us proud. 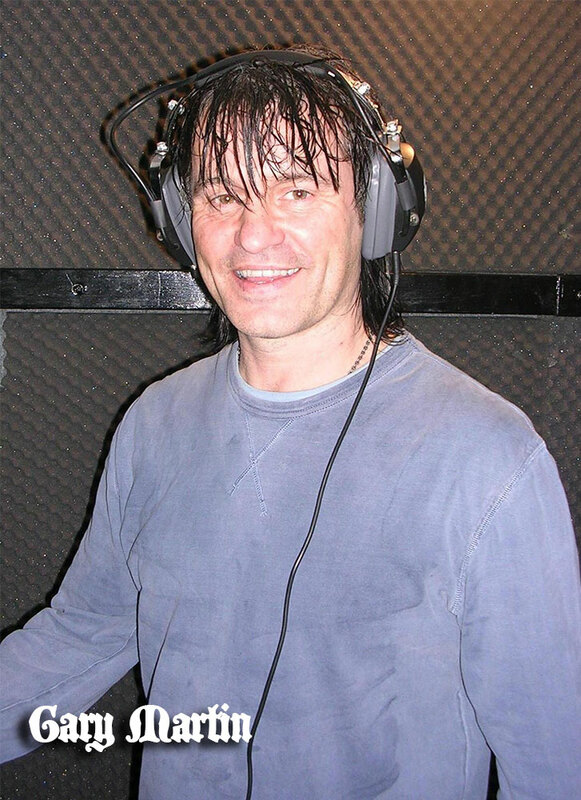 I would like to thank all the vocalists from all over the globe who put their applications in to record this new album, especially to Andrew from Bath, and Jeff from California, I know you guys would have done a great job. This is a direct quote from Phil Cope. “Just a quick e-mail to let you know the recording is going great. We have recorded 4 tracks, over 3 sessions and they are sounding great. 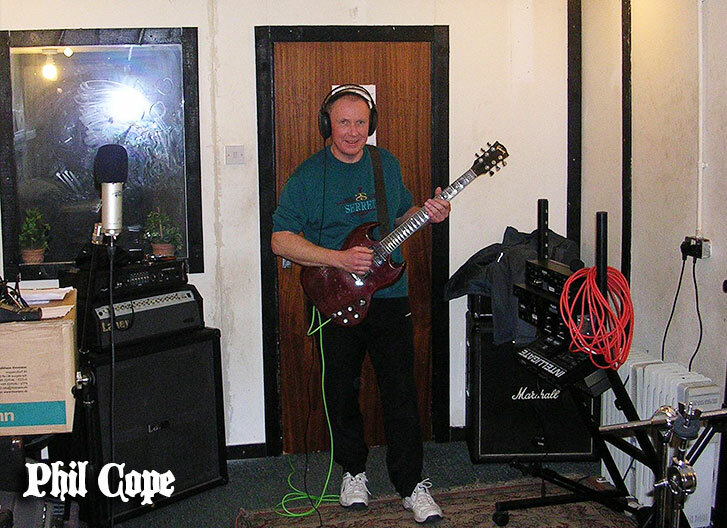 I plan to go in the studio again on Thursday and with a bit of luck they should be almost complete except the vocals. 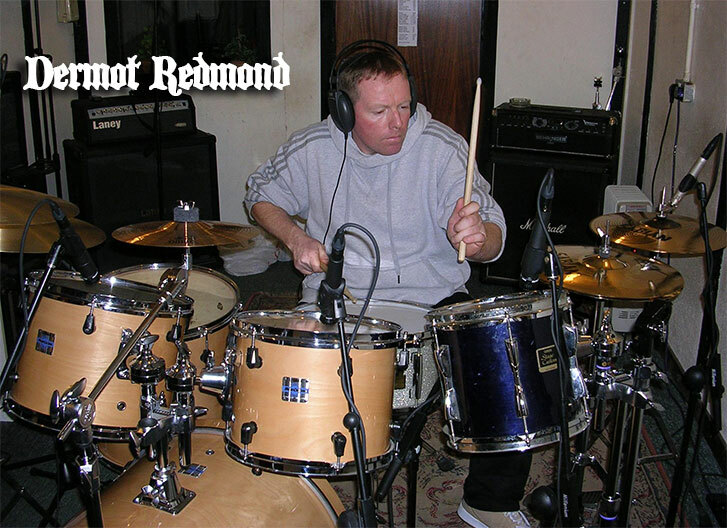 Nov. 13th 2006 – THE BAND HAVE REFORMED AND ARE RECORDING AGAIN!!! They are presently holding auditions for the role of a new singer to replace Zeeb Parkes! Derm, Rod and Phil are back together and it’s official. They start recording 2 tracks next weekend with a view to doing the third album. The band are currently looking for a vocalist to replace Zeeb. We have been asked so many questions about what has happened to Zeeb Parkes? The name Zeeb Parkes was invented purely for the band. When the band split, Zeeb Parkes ceased to be. The character behind Zeeb Parkes who wishes to keep his identity anonymous has moved on to other things. So there you have it folks. All our pestering and support has finally paid off. The lads are reforming and RECORDING!!! I can’t even tell you how excited I am about this. Cheers and thanks to everyone who has visited this site and shown their support for Witchfinder General and each other. This is all your doing. Thank you all very very much. Sept. 2nd ’05 – A FULLY AUTOGRAPHED COPY OF DEATH PENALTY was for sale on Ebay! It was being sold by friends of the band in order to raise money for Toss McCready’s recovery after a horrific motorcycle crash. Just click on the images or this text to visit the item on Ebay. 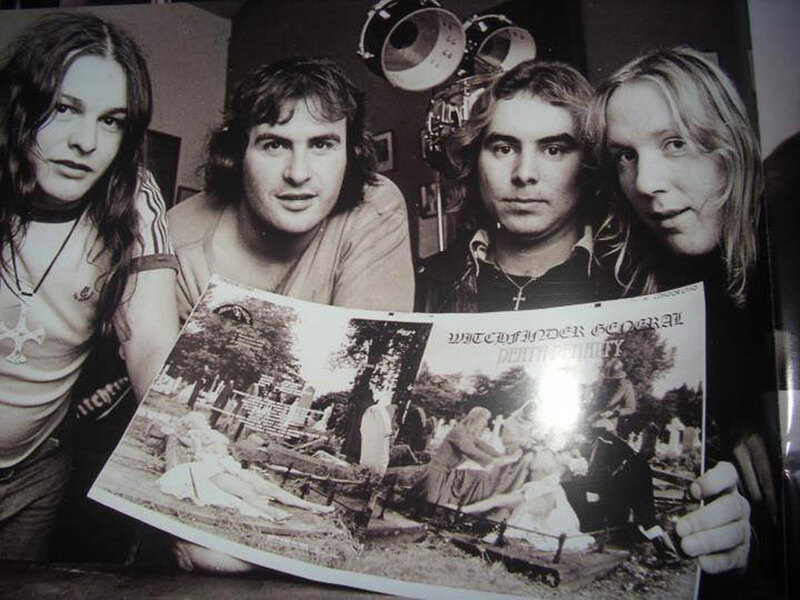 This rare LP sleeve has been signed by ALL the members of Witchfinder General throughout the career of the band and is also signed by Joanne Latham the beautiful model on the cover! This is the only record to ever be signed by the entire band and a signing like this will NEVER happen again. This will be a one of a kind rarity of immeasurable value. Dec. 17th ’04 – I’ve received my X’Mas presents from Phil and soon hope to be getting some goodies from the rest of the boys. So for all the fans out there here’s a peek at something you’ve probably never seen before. Below is an autographed copy of ‘Music” and HERE is a an original publicity shot from Death Penalty! 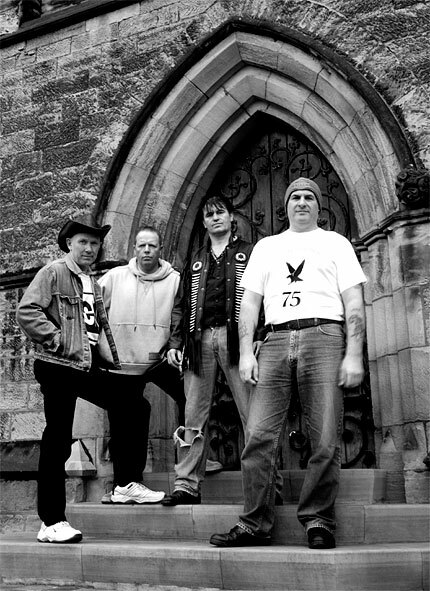 showing in order from left to right: Zeeb Parkes, Phil Cope, Graham Ditchfield and Rod Hawkes.HAPPY X’MAS EVERYBODY! Stay tuned, because the boys ‘av got something for all of ya that will COMPLETELY knock your dirty old socks off!PS – I’ll have shirts in stock soon! All the best ya bunch of die hards. Since launching this site I have received many very helpful e-mails informing me about the band. There is much more to learn though I’m sure. Jan. 21st ’04 – This scan of an original Witchfinder General button was sent in by Russell Vrankovich. Thanks Rus! This one was given to a fan by none other than Phil Cope back in ’81. I’ve since lost this blokes e-mail and memory of his name. Click on the pic of the button to see some recent bootleg buttons that appeared out of nowhere recently. Not nowhere actually. 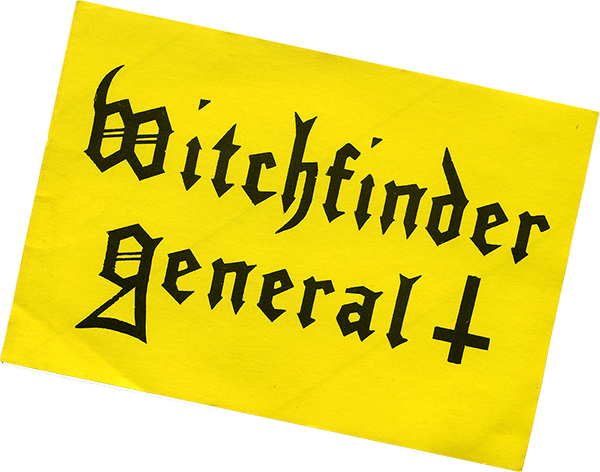 You can buy these Witchfinder General buttons HERE. Nov. 26th ’03 – Hey there again. Got a line from Brazil, and a band there called Denim and Leather www.denimandleather.cjb.net They told me they do a cover of Free Country. So here it is, a medley of Free Country and Witchfinder General by Witchfinder General with a tip of the hat with Death or Glory by Holocaust. Free Country/Witchfinder General/Death or Glory – cover by Denim and Leather. Thanks Sergio! Nov. 10th ’03 – A little tidbit of outdated rumourfluff came my way a few days ago. I’m ususally very weary of passing on any information about celebrities personal lives, but this news is so old it leads to nothing so it can do no harm. Besides it’s in the public domain, so… here’s a little blerb on Graham Ditchfield from 2000. Oct. 7th ’03 – The latest info is a bit of a tease. A source sent me newspaper clippings by e-mail and told me they would post the originals by mail. 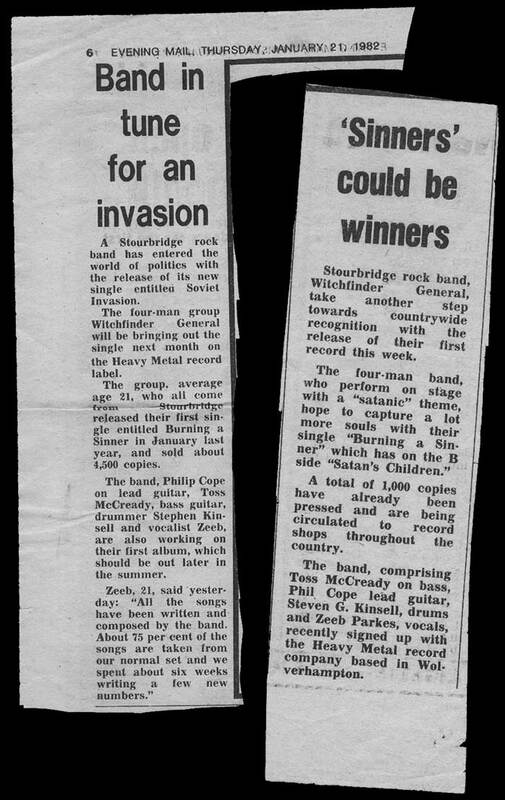 I haven’t heard from them since and that was at least a month ago… so I’m going to share these low resolution scans (that you can’t even read) anyhow, and hopefully the postal service hasn’t lost those clippings! A promo sampler of Friends of Hell was issued on two pieces of vinyl inside a regular sleeve. The interesting part was that each record was completely ungrooved on the b-side…. smooth plastic! Apparently only a few of these are in existence. Another very rare pressing is in a friends collection, and it’s a rare test pressing of the Death Penalty Picture Disc on WHITE VINYL. There’s a sticker on it “HM Worldwide Import HMR003”. 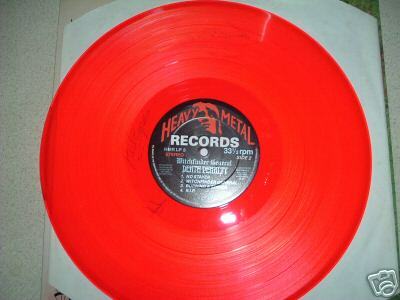 The albums Death Penalty and Friends of Hell as well as Music are available in a variety of different coloured vinyls. I’ve collected black, clear and translucent blue here in Canada. Apparently blue is near impossible to find in the UK. I’ve seen translucent red and silver also. I do not know what countries received what colours. In Canada I found trans blue, clear and black. And I believe that in Germany trans red was issued in greater numbers. Death Penalty: Released on clear, blue, red and black (black being the rare colour on this album). It seems there were 2 pressings. The first with a mistake in the lineup and corrected on the second pressing. A pressing of Death Penalty with a white label has been spotted (normally sports a black “Heavy Metal Records” label). There are clear vinyl pressings of Death Penalty with a “PROMO” label on them, circulating somewhere out there too. Friends of Hell: Released on black, clear and silver vinyl (silver being the rare colour on this album). Incidentally silver was issued without a printed picture sleeve, but rather in a plastic pvc sleeve (like the pic discs). – There was never a pic sleeve so don’t be fooled by ill informed or crafty sellers. The black vinyl version of Death Penalty sports different labels than most pressings. I know a “Soviet Invasion” T shirt was circulating around 1997. It’s sold out now, but I hope to have photos soon. This t-shirt surfaced a while back too. It’s an image stolen from the inner sleeves of both Death Penalty and Friends of Hell. There are many curiosities from the movie that can be mistaken for WFG band kit, so try to make the distinction between them. The band obviously loved the movie. Personally I think the movie is a classic, so it’s all good to me. The book is great too! Pictured above: Graham Ditchfield, Phil Cope, Rod Hawkes and Zeeb Parkes.